It’s that time of year again: gorged on turkey and cranberries, we turn our attention to that oldest and nastiest of contests, the Michigan-Ohio State game. This seemed like as good a time as any to examine the origins of what ESPN has dubbed the greatest sports rivalry of all time. Think the vitriol between the two states dates back to the first matchup between the two football teams in 1837? Not quite. Go back another 60 years and more, and we’ll see that the roots of the conflict began with a land dispute, some petty backwoods squabbling, and a fight over—of all things—Toledo. It’s a tale with oodles of cranky and colorful characters, ridiculous posturing, Congressional intrigue, and a resolution that lost us Toledo but gained us the entirety of the Upper Peninsula. First, some context: in 1803, Ohio was granted statehood and its borders were carved out of the Northwest Territories, that great swath of Western frontier covering Michigan, Wisconsin, Indiana and Illinois. Michigan wouldn’t see statehood for another 34 years, but it was deemed an individual territory in 1805. And there’s when the confusion began. The vast area of the territory was poorly surveyed, and so no one was sure exactly where the border between Michigan Territory and Ohio State lay. This 468 square mile area became known as the Toledo Strip: Ohio claimed it was theirs by right of an 1817 survey, and Michigan insisted that a 1787 survey granted them the lands. When Michigan petitioned President Andrew Jackson for statehood in 1833(led by the charismatic firebrand Stevens T. Mason, just 22 at the time and dubbed “The Boy Governor”), Washington told Michigan it would need to sort out its borders with Ohio before being admitted to the union. The swampy, sparsely settled area sat squarely in a prime developing area: the terminus for two railroads and the Wabash and Erie Canals, not to mention the protected Lake Erie harbor at Toledo itself. And here’s where it gets ridiculous. In 1835, sensing an opportunity, Ohio appealed to the President and Congress to reaffirm that the state line granted Ohio rights to Toledo. Mason, all hopped up on the indignance and righteous outrage that only a 24-year-old with executive powers can possesses, issued the Pains and Penalties Act. This delightfully named act declared it a crime for any Michigan citizen to side with Ohio on the border dispute. He also sent an estimated 1,000 troops down to Toledo, intent on harassing--but not quite attacking--any Ohioans brash enough to hold elections there. Governor Lucaspromptly sent a surveying party to the disputed territory, and rallied 600 militia to camp out in Perrysburg, 10 miles away. Meanwhile, the action, if we can call it that, happened out in the woods beyond those towns. In April, when Lucas’s surveying party reached Lenawee county, the under-sheriff assembled a posse and arrested nine of the surveyors; the rest fled precipitously. After hightailing it back to the safety of Perrysburg, they reported with great drama and not much truth that in this “Battle of Phillip’s Corners” they were attacked, fired upon, and harassed by “an overwhelming force” of murderous Michiganders, hell-bent on committing the grossest outrages on their innocent selves. This sent the citizens of Ohio into paroxysms of panic: they immediately whipped up an “Act to Prevent the Forcible Abduction of the Citizens of Ohio.” What followed was a bumbling, ridiculous set of skirmishes that the nation watched with mingled amusement and alarm. 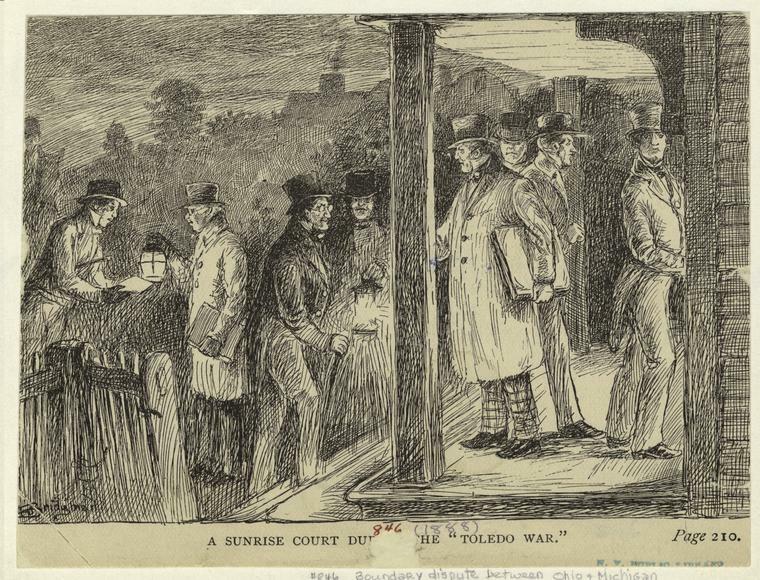 The great Toledo War was, in fact, a booze-fueled series of bar brawls and testosterone-fueled posturings, made more absurd by the fact that often the combatant parties were often unable to find each other in the swampy morass of the borderlands. Michigan bailiffs, sheriffs, and private citizens took to remanding trespassing Ohioans into custody. The single “casualty” of the war occurred in July 1835 when Monroe county deputy sheriff Joseph Wood attempted to arrest Ohioans Benjamin Franklin Stickney and his son, Two Stickney (Two being the second son, after his brother, One Stickney). Two pulled out his penknife, stabbed Wood in the side, and hotfooted it back to Perrysburg. Wood, after securing Benjamin Franklin Stickney into custody, retired to a tavern, where his grievous wound healed itself, probably with the aid of a whiskey or three. It took some time to get Stickney the Elder to jail, as he refused to sit upright on the horse to which he was tied, and instead flopped around like a gutted fish all the way to Monroe. Finally, President Jackson stepped in to resolve the squabble between the two frontier brothers. A bit busy himself, what with Texas declaring independence, a recent assassination attempt, and the Second Seminole War,Jacksonhad had enough of this petty backwoods comedy of errors. In no uncertain terms, Jackson and Congress told Michigan that the Toledo strip was Ohio’s, and took steps to remove the Young Hotspur from office. A June 20th, 1835 Act of Congress essentially told the two young principalities to cut it out. I was actuated only by a desire to prevent a collision between the two authorities [Michigan and Ohio militias], and I had flattered myself that I had appealed to one, whose age, wisdom, experience and patriotism, would insure a successful result. –Had the conciliatory feelings manifested by Michigan been met by a spirit of forebearance, much of the bitterness, which is now mingled with the controversy might have been avoided. “But [he continues], I will not pursue the subject. It would ill-become me to speak of the manner in which the propositions of Michigan have been met by the Exeutive of Ohio. Self-respect, and the official courtesy due from one state to another, forbid the imitation of an irritating example, however elevated may be the source from which it has proceeded." Anyone with a sibling can relate to the affronted “He was on my side first, he started it” sentiment behind Mason’s outraged address. Despite his pleadings, he was ousted in late August. "The colonel of the regiment finally came to their assistance. He upbraided the judges for their cowardice and hesitation, and proposed to take the honor of the State into his own keeping. Stepping in front of the soldiers, he called for volunteers for a ‘hazardous undertaking’. A few brave men answered the call. The trembling judges placed themselves under the charge of this forlorn hope; and, at three o’clock on Monday morning, the seventh day of September, A.D. 1835, they sneaked into Toledo, hunted up a school-house, held court about two minutes, and then ran for dear life back to Maumee. Thus did the State of Ohio triumph over her enemies. Thus did her patriotic sons sustain her dignity. Thus did her brave soldiers throw themselves in the ‘imminent and deadly breach." Essentially, the war was over. Michigan delegates continued to crow that Ohio’s occupation of the borderlands should be avenged, but the fight was over. It was clear to the territory’s lawmakers that if they wanted statehood, they would have to accept the redrawn border and cede Toledo. To soothe our wounded egos, however, Congress threw in the lands of the Upper Peninsula then belonging to Wisconsin Territory, and the state of Michigan entered the Union in its current shape in January 1837. Wisconsin had no say in this transaction, not having a large enough population to influence anyone. So, sorry Packers and Badgers fans. Blame Ohio, not us. We always do. See Tuttle’s General History of the State of Michigan, with Biographical Sketches, Portrait Engravings, and Numerous Illustrations, p. 472. 1873. The legal disputes actually went well into the 20th century, with the Supreme Court finally ruling once and for all in 1973 that the area really truly, once and for all, belonged to Ohio. Posted in Detroit History, Pre-1900 and tagged Boy Governor, Michigan, Michigan History, Stevens T. Mason, Toledo War, Upper Peninsula.